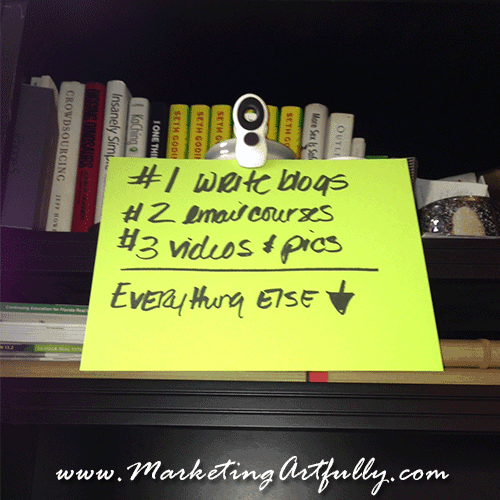 Entrepreneur Marketing - Marketing Focus...what are your three most important things? You are here: Home / entrepreneur marketing / Entrepreneur Marketing – Marketing Focus…what are your three most important things? Okay, if you have followed me for any period of time you know that I think that you should only have three main focuses (focusi?) for your business and your entrepreneur marketing. Because most entrepreneurs are a little ADD and jump around, I strongly suggest that my clients pick three things for three months at a time! For me right now that is Speaking and Authoring a book, client work and…this is a big one for me…affiliate marketing! So I was sitting around the other day (at my computer “working”, but work without focus is just sitting) trying to figure out what to do next and I thought, “a ha, I will do some client work”. Then I was still sitting and checking my email and social media….more sitting and finally I started writing a blog post, but then someone called and I had to some more client work. Now client work IS one of the three things I HAVE to do (it puts food on the table for kitty), BUT it is not something that ONLY I can do. Wait, you mean that there are other people who can do tasks better than I can when I don’t love them…um…YES! So here it is…DO THIS! End of conversation. These are the three things I have to do BEFORE I do anything else EVERY DAY. Now, get yourself a piece of colored paper like I did and write them big and bold. Put them up where you can see them ALL DAY while you work. When you find yourself straying into other things, ask yourself, “am I done with my three things” and if not, “is there someone else who could do the non-three things”. I have to say that if you asked me the three easiest things to do in my business I would cite the same list. I KNOW blogs work because I have been pounding them out for years and like getting the chance to research or write them. I make videos about what I see as things people are missing in their marketing and I am a graphic artist so making pictures is actually fun for me. BECAUSE they are all easy for me, sometimes it feels like “cheating” to spend my days doing them. There is so much other “stuff” that needs to be done that “just” working on my important things feels like shirking my duties or playing hokey! Tweet this out – just click the link and your Twitter will pop up!